Please fill in your full postal address including the postal code. The Cape Bird Club is an Affiliate Member of BirdLife South Africa. . Membership is for 12 months from the date of joining and is renewable each year. 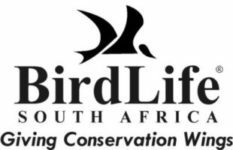 Members have the option to become members also of BirdLife South Africa. Membership Rates are valid until 30 June 2019. Please select your options below. Where did you hear about the Cape Bird Club? Members of BLSA can subscribe to the magazine at a reduced rate. Please indicate below if you would like to include the magazine with your membership.